A while ago we were given a whole box full of children's chapter books. As I combed through the books with excitement, I was thrilled with the classics I found buried and anticipated reading some new adventures with my children. 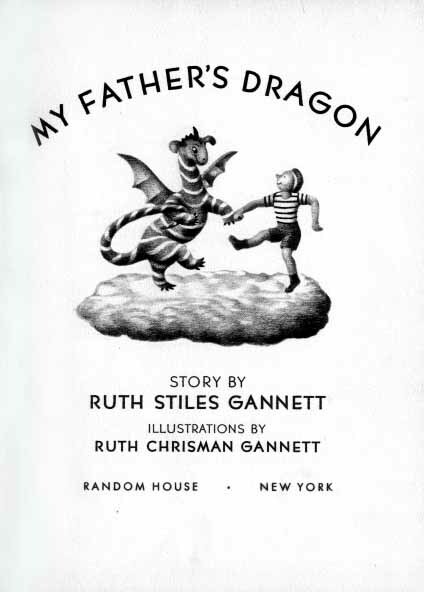 There was one thin book that especially caught my eye, My Father's Dragon by Ruth Stiles Gannett. All illustrations from My Father's Dragon are from here. As I looked at the picture on the cover, a nostalgic feeling swept over me. I used to love story time in school, sitting in a warm room after recess, listening to the teacher's voice bring the characters to life. 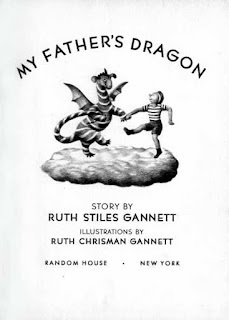 There are many specific books I remember hearing, including My Father's Dragon. I remembered loving the story, yet I could not remember any details except something about fruit trees. I was immediately excited to read the story aloud with my little ones. My Father's Dragon proved to be a success again all these years later. 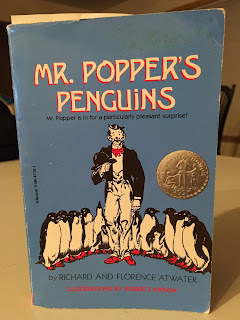 I was surprised by the book's simple tale, but the kids were fully entertained by Elmer's adventures and the straightforward tone of silly passages. One of the funniest themes in My Father's Dragon is Elmer's packing and use of his knapsack. 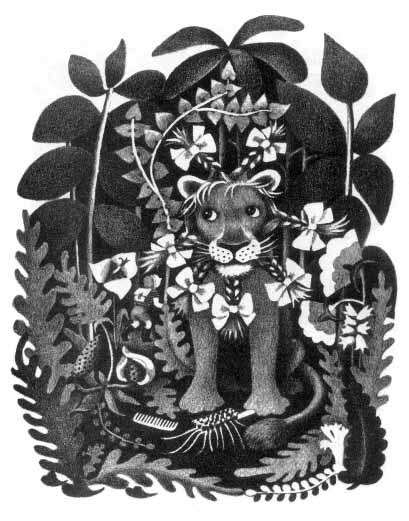 In the story, Elmer learns of an island where wild animals rule. They have captured a baby dragon and use him as a slave to carry them across the river. 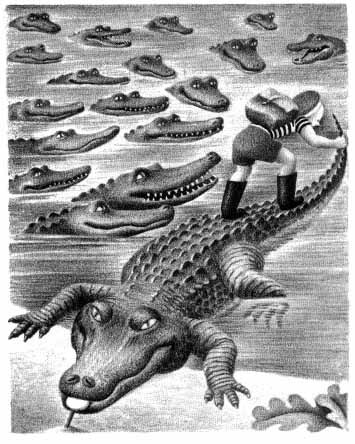 Elmer decides to go rescue the baby dragon and packs his knapsack to go. Of course, in his knapsack, Elmer packs "chewing gum, two dozen pink lollipops, a package of rubber bands, black rubber boots, a compass, a toothbrush and a tube of toothpaste, six magnifying glasses, a very sharp jackknife, a comb and a hairbrush, seven hair ribbons of different colors, an empty grain bag with a label saying 'Cranberry,' some clean clothes, and enough food to last" (My Father's Dragon, page 18). The real fun and clever story telling comes as Elmer uses each item in his pack to escape treacherous animals and dangerous situations. For example, Elmer evades an arm-twisting gorilla when monkeys surround the creature to see his fleas through Elmer's magnifying glasses. 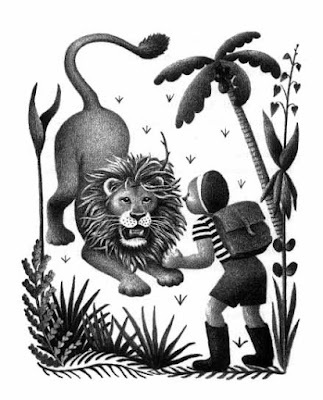 A ferocious lion is appeased with new ribbons for his unruly mane, and alligators turn from predators into a bridge through the expert use of lollipops. Elmer has two more books and over the ensuing weeks we read them all, thoroughly enjoyed them, and then went on to the next choice for bedtime story. Well, yesterday I listened to a religious speech that led my thoughts back to My Father's Dragon. In the speech, Joseph Brough says, "Heavenly Father knows what you and I need better than anyone else. As a result, He has developed a personal care package suited to each one of us." 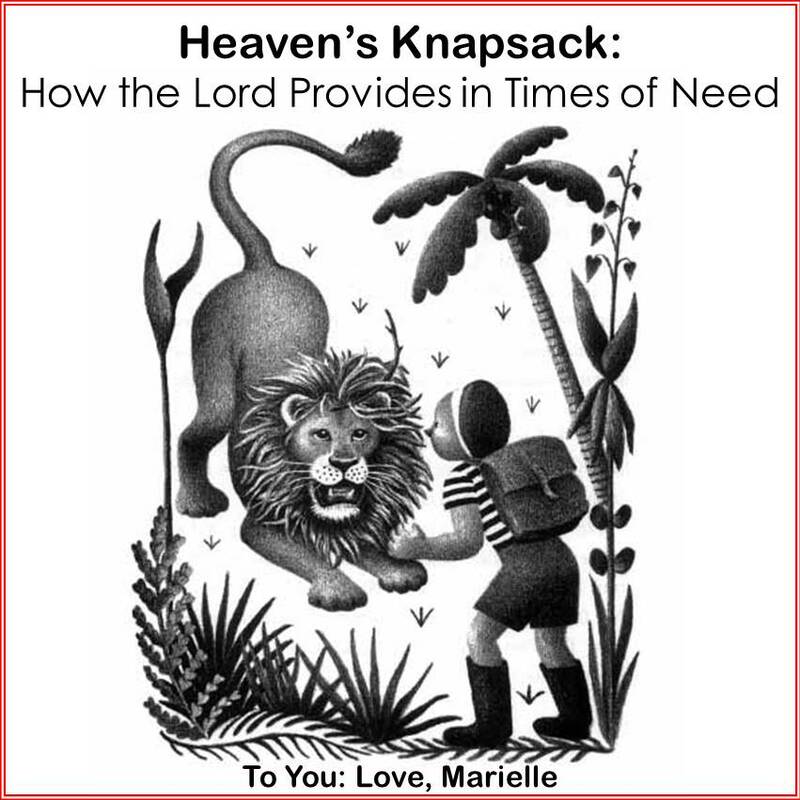 The thought struck me that the Lord has provided each of us with just such a life-saving knapsack as Elmer had. 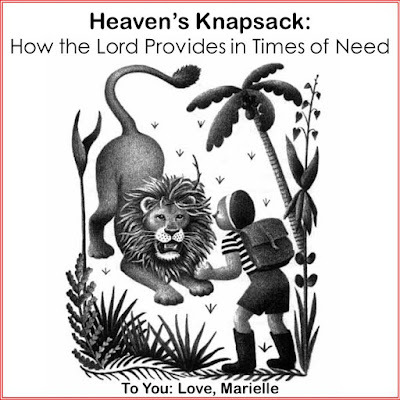 Our knapsacks from Heaven, or care packages as Brough calls them, contain such things as "the Holy Ghost, commandments, scriptures, prayer, prophets, apostles, parents, grandparents, local Church leaders, and many others." Some of these gifts, like the scriptures, are given to all. Other items, experiences, or people in our care packages are personalized just for us. Just as Elmer found lollipops when he faced hungry alligators, we often find the Lord has already provided when we face life's challenges. The provision may come as a remembrance of what a friend has recently shared that uplifts and guides. The provision may be a "coincidence" that helps us feel someone understands our needs. The provision may be the scriptures or prayer that are constantly available for our profit. The Lord sent us to earth with all the gifts we need to return to Him. Today I address three myths that stand in the way of our feeling the reality of that truth. As we overcome these myths, we more fully recognize the Lord's provisions in our lives. Myth #1: I do not have what it takes. Sometimes we don't feel we have what it takes to overcome a challenge. We lack confidence, either in ourselves or in what we've been given from God. We may think our tools are lacking. We may have cause to ask, "Really Lord? You are giving me hair bows? You know these are lions, right?" But the Lord in His infinite wisdom does know that they are lions, real lions. And He knows perfectly how to provide for our needs. I have seen this to be true especially of prayer and scripture study. Sometimes we want something more from the Lord, something different or bigger or more grandiose, a miracle of sorts. More often than not, however, I have found the answers to my challenges through the simple yet profoundly powerful experiences of prayer and scripture study. You do have what it takes to overcome life's challenges. The Lord provides. Myth #2: I always know when God is working in my life, and it's not today. Maybe it's been a bad day, or a bad week, or even a bad year. Hey, we've had those. We might not always understand why we have been given certain commandments, situations, or acquaintances in our knapsacks. We might be tempted to think that the Lord is taking a break from our lives. It may happen that you receive an answer to a prayer that doesn't make sense. Sometimes we feel directed to do something and do not know why. 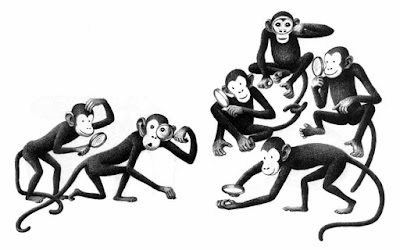 Elmer may have wondered, "Why do I need six magnifying glasses? Won't one do?" We may question, "Why do I have to deal with this certain person? Or go this specific way? Or deal without this request?" We may not understand the events of our lives. Many years ago, we were searching for a new job out of school. I was pregnant at the time. My husband felt inspired to look in a specific city where we had not planned to live and later to apply for a specific job that didn't even fit his job description. As the situation worked out, he was hired for the job we had hoped for. We were grateful for a job, but we didn't understand why the Lord put this specific job into our knapsack until months later. Among other blessings, this job presented just the opportunities and timing we needed to provide medical care for our child that was born premature. We have often looked back at the details of this period in our lives and wondered at how immaculately the Lord guided and provided. God is working out the details of your life too. Trust Him. Myth #3 The Lord provides for others, but I am not worthy. Many of us may believe that God is able to provide all the blessings we need and desire, but may question, "Why would He do that for me?" Maybe we feel ourselves unworthy of the Lord's care and attention. Maybe we feel He saves His help for the truly needy, and I am just normal. For many reasons, many of us believe the greatest of the Lord's blessings are reserved for others. I want to share that I know the Lord's blessings are limitless. He wants to give freely to all. Some of those blessings require our asking for them. Some of those blessings require an expression of faith before we recognize them for what they truly are. However, the blessings of the Lord are there. They are always there because He loves us infinitely and knows us perfectly. The Lord loves YOU infinitely and knows YOU perfectly. Psalm 23 beautifully describes the sentiment. God is good. He provides all we need. He is able to lead us to eternal places of peace. The greatest Gift we are given in our knapsack is the life and atonement of Jesus Christ. He is the way to lasting joy and eternal life in the presence of our Heavenly Father and loved ones. I hope as you go through life you will feel buoyed up by Heaven's knapsack you are invited to carry. I hope you feel God's love and guidance in your life. How have you seen the Lord provide for you or your family in times of need? Have you ever realized the Lord had already provided when a need arose? Please share in the comments. I love hearing from you. This post may be shared at some or all of the Link Parties I love. Thank you for hosting! If you had the chance to travel back in time and listen to Moses or Isaiah, Peter or Paul, would you? These were not only good men, but also men called of God as prophets. And if such a trip were possible, how would you prepare for it? I'm sure there would be some physical preparation in deciding what to pack, but more importantly, there would be spiritual preparation. 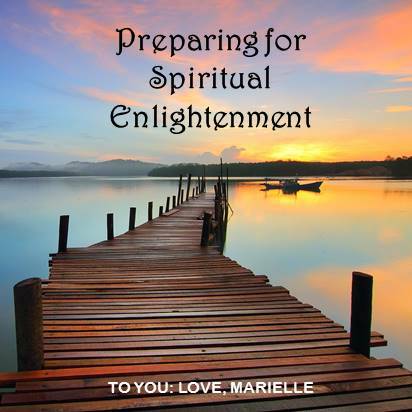 How would you prepare yourself for spiritual enlightenment? Members of the Church of Jesus Christ of Latter-day Saints (LDS) look forward to a similar experience. We believe that there are men called of God today as prophets, seers, and revelators. They travel the world instructing congregations and leading the expansive church. Twice a year in a gathering called General Conference, these men and other leaders speak to the world in six sessions covering twelve hours over two weekends. Many churches have similar gatherings or other holidays that they look forward to as opportunities for spiritual growth. Today in our Sunday worship services, we were encouraged to prepare ourselves for the upcoming General Conference. We were taught that how much we prepare will be commensurate to how much we get out of the experience. As I thought about this challenge, I brainstormed a list of ways to prepare to hear a prophet speak. If you were taking that trip back in time, or in looking forward to your own similar experience, would you do any of the following? Become familiar with the faces of those who might speak. Memorize the speakers names and learn about their backgrounds. Read what the speakers had previously taught. Make a plan for helping yourself and your children focus during the talks. Review your personal notes and thoughts from similar earlier experiences. Define a question or specific challenge you hope to learn about. Evaluate how you had changed or grown from similar opportunities in the past. Pray for guidance and growth. Each of these activities might help us look forward with anticipation to and increase our learning from the event. 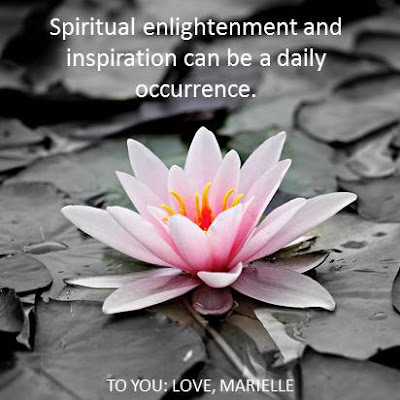 However, spiritual enlightenment and inspiration can be a daily occurrence. While a special conference or holiday is one such opportunity, we don't need to wait for one in order to learn from the Lord. What is the key to being prepared for spiritual enlightenment? How can we invite more spiritual inspiration into our lives? I thought about my specific list and how those activities could be organized under principles. Two ideas emerged. In order to prepare ourselves for spiritual inspiration, we need to reflectively appreciate what we have already been given, and we need to humbly seek more. Each of us has been given so much to learn from. We all have sacred text or scripture. Do we show our gratitude for the Lord's word by spending meaningful time in it each day? We have also each been blessed with unique experiences for growth. Do we record those life experiences and the things we learn? Do we revisit life's teaching moments? Do we give thanks in prayer and action for the lessons we have learned? If we are not grateful for what we have received in the past, we are less likely to receive more. We also need to humbly seek more inspiration. 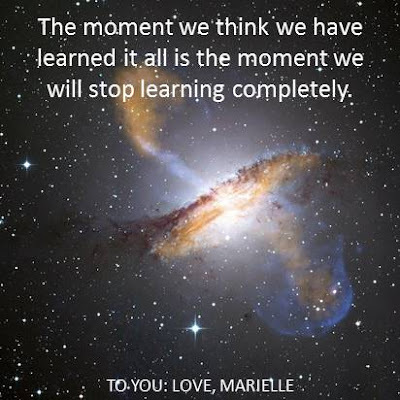 The moment we think we have learned it all is the moment we will stop learning completely. Humility, in much of society, is seen as a weakness or something to overcome. We are taught to be strong and independent. Yes, we are taught it is important to listen to others, but more so in order to understand "where they're coming from" rather than because they have something valuable to teach us. Without humility, we can fall into the trap of believing we are better than others, we already have life figured out, and others do not have anything to offer us. This pride can eventually lead us to feel that we have learned all we need to from the Lord as well. This kind of thinking includes the thought that God has already taught me all He will, now I just need to put it into practice. Who are we to limit the teachings of the Lord? If He wants to give me more, why would I say, "No thank you?" Instead, we ought to approach each day with an open heart and an open mind, "serving the Lord with all humility of mind" (Acts 20:19). Do we have our ears and hearts open to learn from any source the Lord might use today? We are taught, "If my people, which are called by my name, shall humble themselves, and pray, and seek my face, and turn from their wicked ways; then will I hear from heaven, and will forgive their sin, and will heal their land" (2 Chronicles 7:14). What a beautiful promise! Our land can be healed! I believe this is our land as a people, but also our land as individuals and families. This is our promise if we humble ourselves, pray, seek the Lord, and turn away from the habits and actions we have learned to be wrong. Did we pray this morning to learn more? Do we regularly pray for growth according to God's will? Did we pray for help to turn away from wrong? Do we seek the Lord's face? 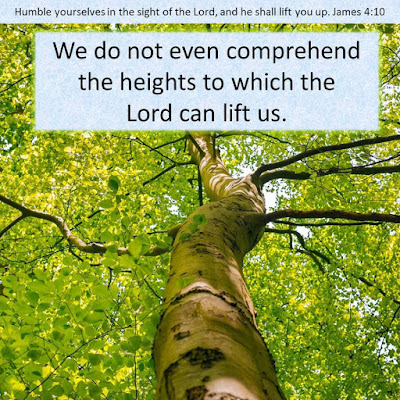 I have found the teachings of James to be true: "Humble yourselves in the sight of the Lord, and he shall lift you up" (James 4:10). 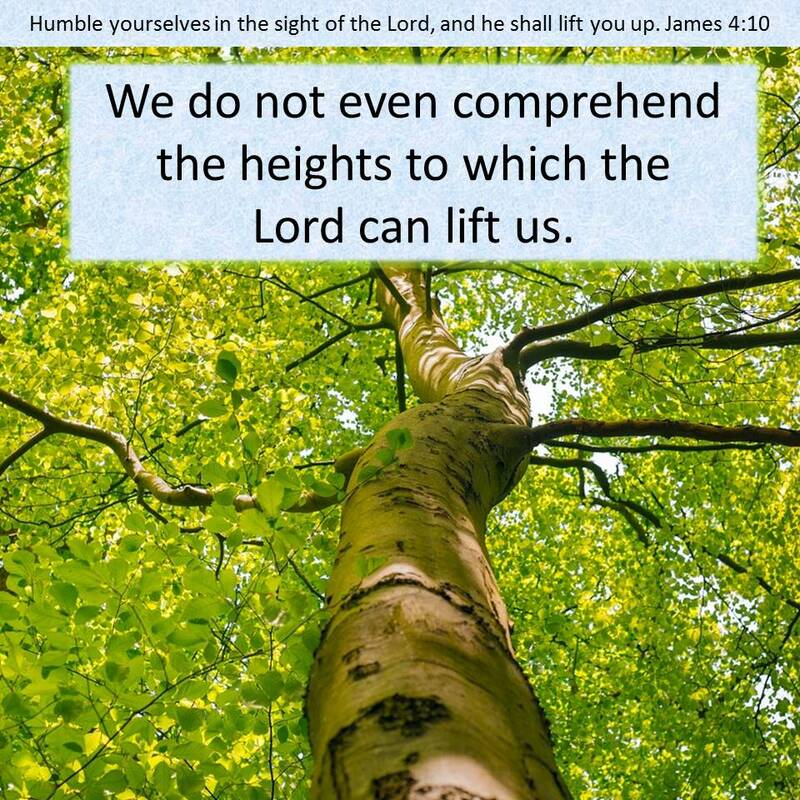 We do not even comprehend the heights to which the Lord can lift us. As we approach each day with gratitude for lessons learned and humility of heart and mind moving forward, we send a clear message to God: I want to learn everything you can teach me. That is the soul that is prepared for spiritual enlightenment. What event(s) do you look forward to as opportunities to learn? How do you prepare yourself for daily spiritual inspiration? Please comment, as I love learning from you. While I am a well-meaning member of the Church of Jesus Christ of Latter-day Saints, all views expressed are my own. 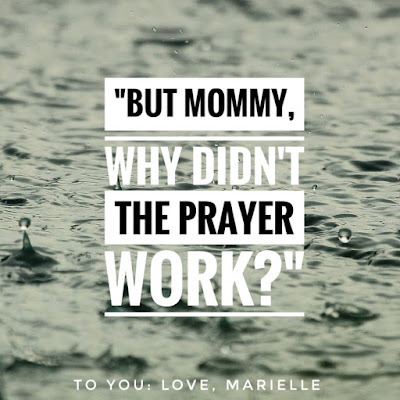 "But Mommy, Why Didn't the Prayer Work?" One of our close family friends had been battling cancer valiantly. We were keeping in touch long-distance via texts, phone calls, and occasional visits. I was at another friend's house picking up my son when I received a text: a text telling me that the doctors told this family there was nothing more they could do. This dear friend was going on hospice care. I held it together until we got in the car. Then I broke down. Tears streamed as I imagined their three little kids without their Daddy. 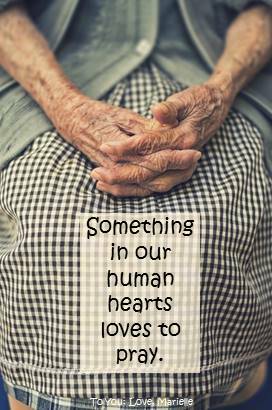 My heart ached as I thought of my sweet friend a widow at our age. I cried for our friend's physical pain and all that he had done to fight this cancer that was taking over his body. Then from the back seat I heard, "Mommy, what's wrong?" I told my son what was happening. 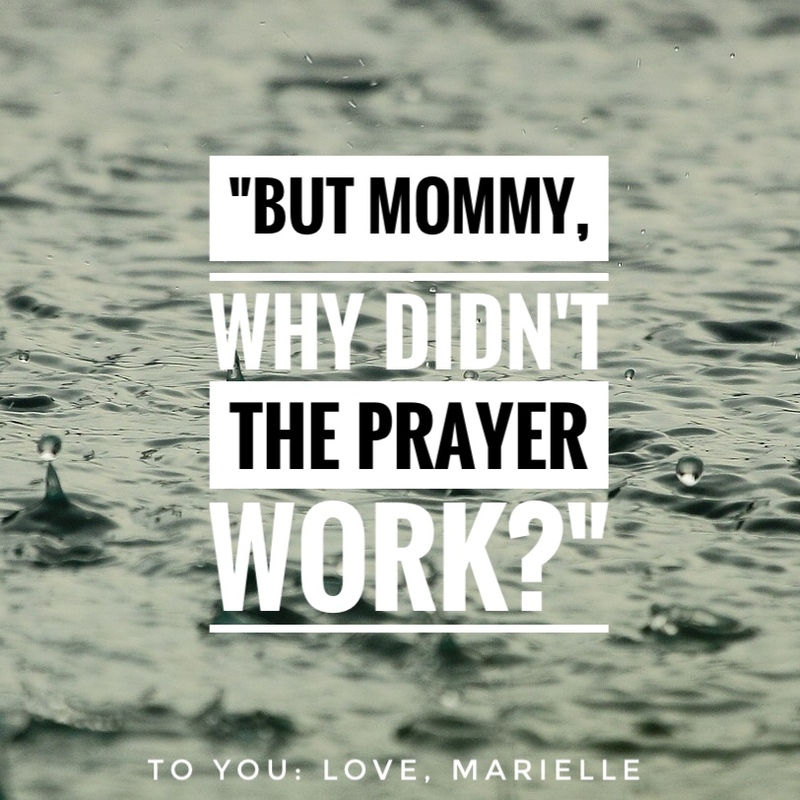 My sweet four-year-old then replied, "But Mommy, why didn't the prayer work?" My heart broke anew. We had been offering prayers for this family for a long time, as had friends and family across the nation. Why hadn't the prayer worked? Why wasn't this saintly soul (and they are both of them saintly souls) going to be healed? I answered the best I could. "Heavenly Father has a plan for each of us. Sometimes that plan is not what we hope for, but we need to trust the Lord that it actually is what's best for us. Our friend may still receive a miracle, but he might not. We trust Heavenly Father." At that moment, that was enough for my little guy. He nodded, looked out the window, and went on with his own thoughts. But my adult mind kept thinking. I fully believe everything I told my son. I do have faith in the Lord's plan for me and for each of us. I have faith in an afterlife where families are together forever and seeming injustices are made right. However, my mind wandered to the next question that my son hasn't asked yet but that he may ask someday: If the Lord's plan is going to happen anyway, why do we even pray? Why pray if you're not going to get what you ask for? Why pray for healing if the afflicted may die anyway? Why pray for a loved one gone astray if that loved one has agency and may not change at all? 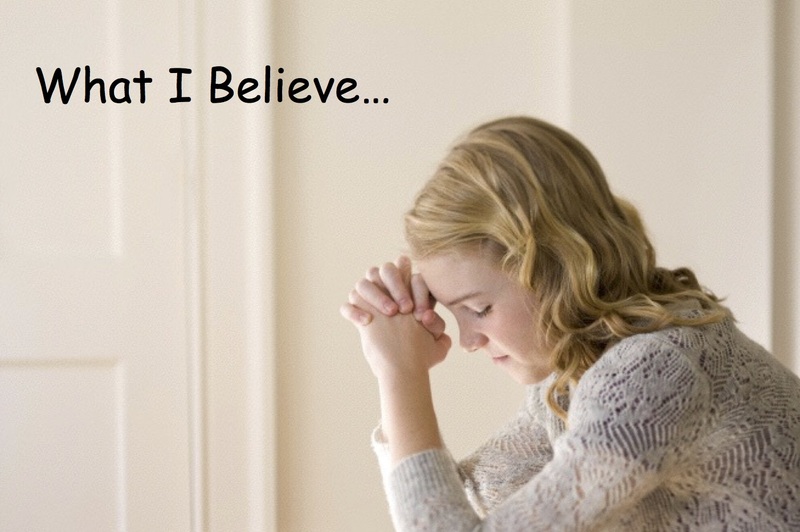 Why pray for a child if we are destined to remain infertile? Why pray for world peace if the Lord doesn't feel right about overpowering millions of people's choices right now to accomplish that peace? Why pray at all? Why pray if you're not going to get what you ask for? As I have pondered and studied possible answers to this question over the last few weeks, insights have flooded my mind and feelings have filled my heart teaching me. I am learning that while we do not know everything, and while we need to continue to live by faith, there are some answers that feel right. Through time, God has commanded His people to pray. And people have heeded that command. Spend a day with Muslims, Jews, Mormons, or Protestants and you will see them pray. The prayers may look or sound differently, but they are prayers to God. Athletes pray before games, legislators pray before session, and kids pray before meals. God would have a prayerful people, and something in our human hearts loves to pray. Some people see commandments as ways for churches to control their people. Others see commandments as restricting, set about to limit fun and ruin lives. (Sound familiar to any parents of teenagers?) However, a story told recently demonstrates why I believe commandments are given. A man was surfing at a beach where he was on vacation. Some young surfers around him were complaining about a barrier that didn't allow them to go out to deeper water and bigger waves. As the protests continued, an older man listening nearby finally spoke up. He explained a truth to the disgruntled surfers. 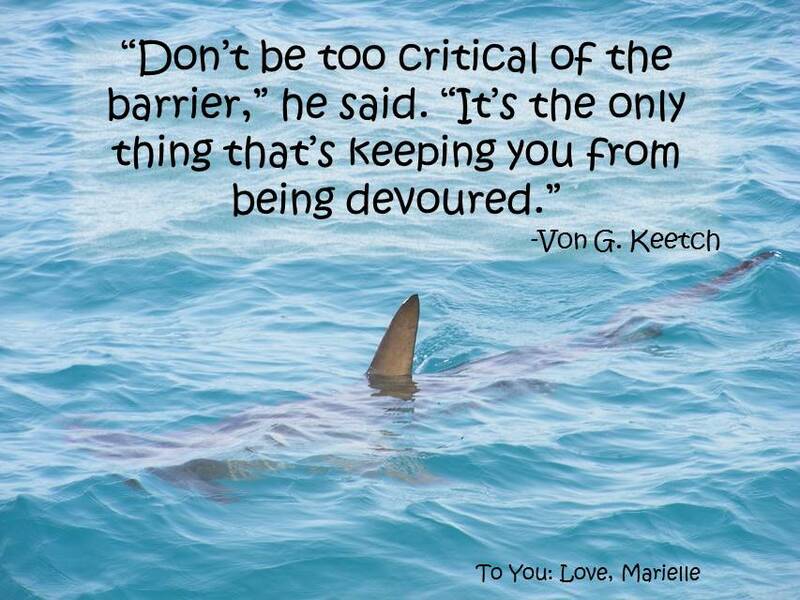 "'Don't be too critical of the barrier,' he said. 'It's the only thing that's keeping you from being devoured.'" 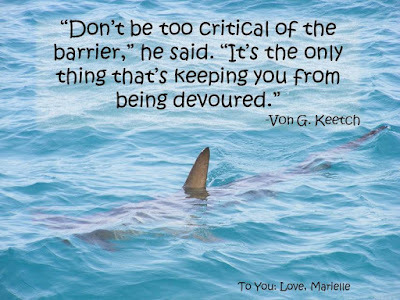 From their vantage point, the vacationer and young surfers could not see the sharks just beyond the barrier, but someone else's wisdom set the boundaries, protecting and preserving them. Commandments are given for our own good. The commandment to pray is not given in order to waste our time or to buff up the ego of a self-centered God. No, the commandment to pray is given for our own good. Sometimes prayers are answered exactly as we hope. Isn't that amazing? Sometimes miraculous healings occur, jobs are obtained, or those lost keys are found. Some blessings are conditional upon our asking for them. I cannot count the times I have felt my prayers answered in simple and profound ways. Sometimes the answer to prayer is seen immediately. Like when my daughter prayed to find her shoes last night and immediately when exiting the room, thought she should look under the bed. There the shoes sat. How happy she was to see her prayer answered! Often, however, the answer to prayer is seen after the dust has settled and we reflect upon life's happenings or after we have waited longer than we planned. Sometimes answers to prayer take a form different than we imagined. The Lord always knows better than us. "For my thoughts are not your thoughts, neither are your ways my ways, saith the Lord. For as the heavens are higher than the earth, so are my ways higher than your ways, and my thoughts than your thoughts" (Isaiah 55:8-9). If we pray to get this new job so that we will be able to better provide for our family, the bigger hope is really providing. Perhaps being turned down for this job allows us to interview for the second job (or third or eighth) that will fill our needs better than the first and beyond what we imagined. Garth Brooks sings a similar message: "Some of God's greatest gifts are unanswered prayers." I am also beginning to see that there is a miracle of prayer that occurs when our prayers do not seem to be answered at all. The miracle occurs when our chronic illness continues, we fail the big test, we lose our home, or we never receive an answer to our questions. The miracle occurs when the one we've prayed for is going to die of cancer. The miracle of prayer is much bigger than homes, jobs, or even health. The true miracle of prayer happens in our hearts. True prayer is fervent communication with an actual being. It feels like we are talking to our closest friend, because we are. We empty our load and seek guidance. Prayer is the perfect, Divine equivalent of counseling. We pour out our hearts in gratitude and pleading. 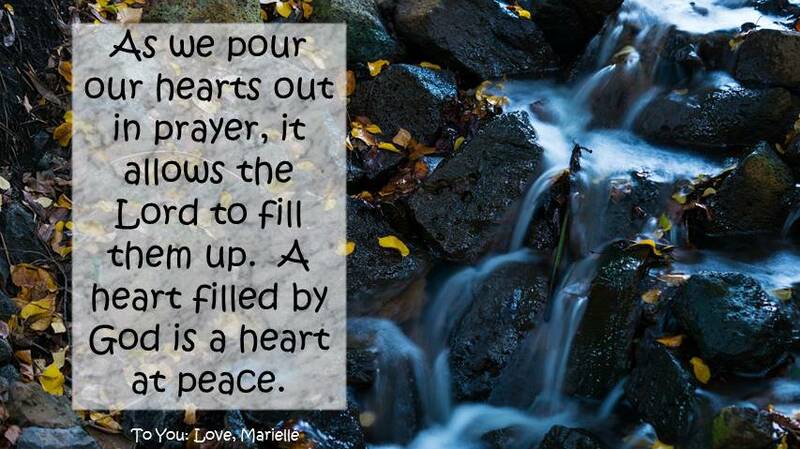 As we pour our hearts out in prayer, it allows the Lord to fill them up. A heart filled by God is a heart at peace. We will notice the miracle of prayer become even stronger and more evident in our lives when we pray as the Savior did, when we can say with all sincerity, "Thy will be done." The miracle of prayer will increase when we start believing that God really does love us and that He really can help us be happier than we can be on our own. 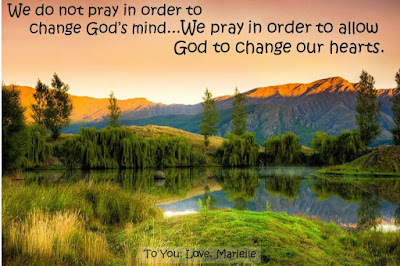 We do not pray in order to change God's mind. We pray in order to allow God to change our hearts. "But Son, the Prayer Did Work." After hearing the devastating news from our friends, we were able to go visit two weeks ago. We wanted to tell them how much we love them and enjoy some time together. We went expecting to uplift and cheer them. However, what we saw was the miracle of prayer. Our friend's body was wracked with cancer, but their home was filled with love. There was laughter and joy amidst the sorrow. They had witnessed many tender mercies along the way, and now, they were at peace. We left uplifted and inspired. 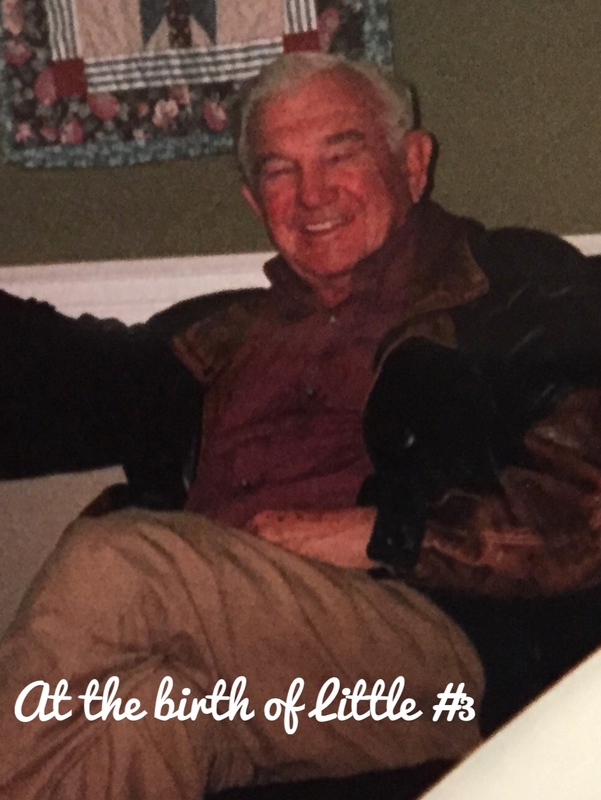 Our friend passed away peacefully last week, and we were able to attend his memorial. At the end of the services, my friend, now a widow, stood to share her message. 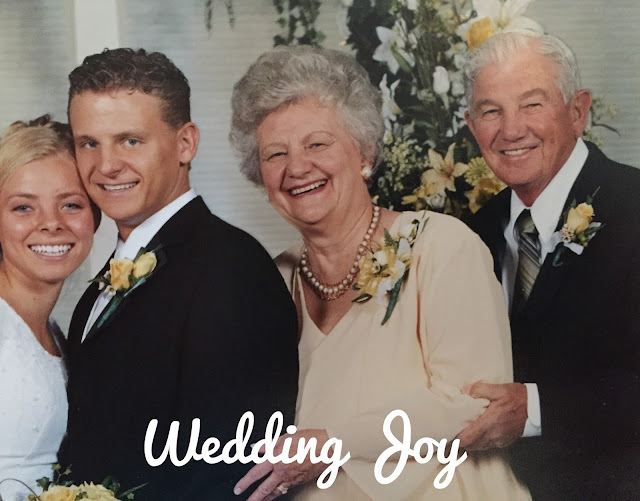 Through tears she said, "My husband would want me to tell you that there were miracles and prayers were answered." If we were to go back and my son asked his question again, I believe I would start my answer with, "But Son, the prayer did work." There is a power in prayer. I invite each of us, no matter how long it has been or even if we never have before, to open our hearts to the Lord in prayer. He will answer. 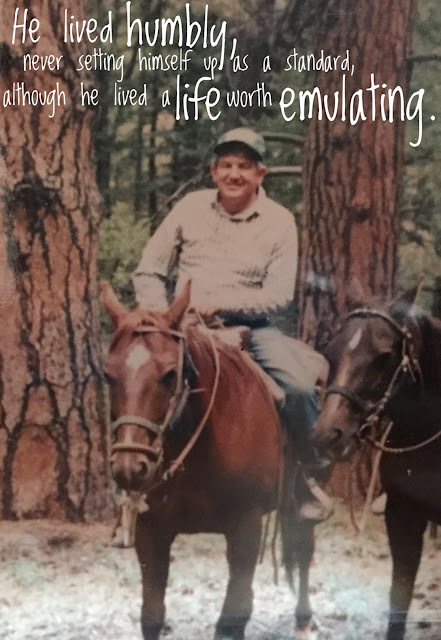 Several years ago, I was sitting in a Sunday School class listening to my father-in-law teach. He asked us how we wanted to be remembered when we died. How would we measure our success? What word did we hope would be used to describe us by those who knew us? It's not a new question. On that Sunday afternoon, we went around the class and a few people gave their answers. I have been in many classes over many years, but I clearly remember this one as my father-in-law gave his answer. What word did he want to describe him? Charity is more than giving alms or offering service. It is a way of being. It is a trait that fills your inside and shows itself in word and action on the outside. It shows itself in kindness offered to a stranger and quiet acts of goodness. It shows itself in patience and forgiveness. It shows itself in humility. Last year my wonderful father-in-law passed away. With his passing, members of his community began telling stories. "Your dad paid for my piano lessons." "One night I heard a noise in the garage. I knew I hadn't locked it and wondered if it was an animal or even a burglar. I went down to the garage and found your dad filling my freezer with fresh fish." "Your dad did all my dental work for free." "Your dad donated the land that church was built on." "Your dad made everyone feel like he was their best friend." The examples went on and on. The one word that came up over and over? Charity. Dad had chosen his word wisely and then lived it. He was far less concerned about how much money was in his bank account or what his car looked like than he was about helping someone in need. He lived humbly, never setting himself up as a standard, although he lived a life worth emulating. He didn't care what religion you were or weren't, he loved you without guile. Charity never faileth (1 Corinthians 13:4-8)." I feel it was a privilege for me to know this great man and see how his daily choices created layer upon layer of goodness. These seemingly little choices included what he said, and in his case often what he did not say, and how he spent his resources like time and money. I am not saying Dad was perfect. Nobody is. I am saying that what he lacked was overshadowed by who he was. He found a way to live so that he would be remembered the way he hoped to be; remembered by the one word...charity. I know I am far from where I could be. I still lose patience with my children and am often inconsiderate. My list of flaws is not short. However, reflecting on the lives of my father-in-law, other people I admire, and especially Jesus Christ, helps me to see a more clear path for who I want to become. As I consider who that person is, I continually come back to the same word my father-in-law chose. There are a lot of admirable qualities, but if I "have not charity, I am nothing (1 Corinthians 13:2)." What is your word? How do you want to be remembered? Think on that. Then, live it. Does seeing examples of charity inspire you? Who have you learned from? 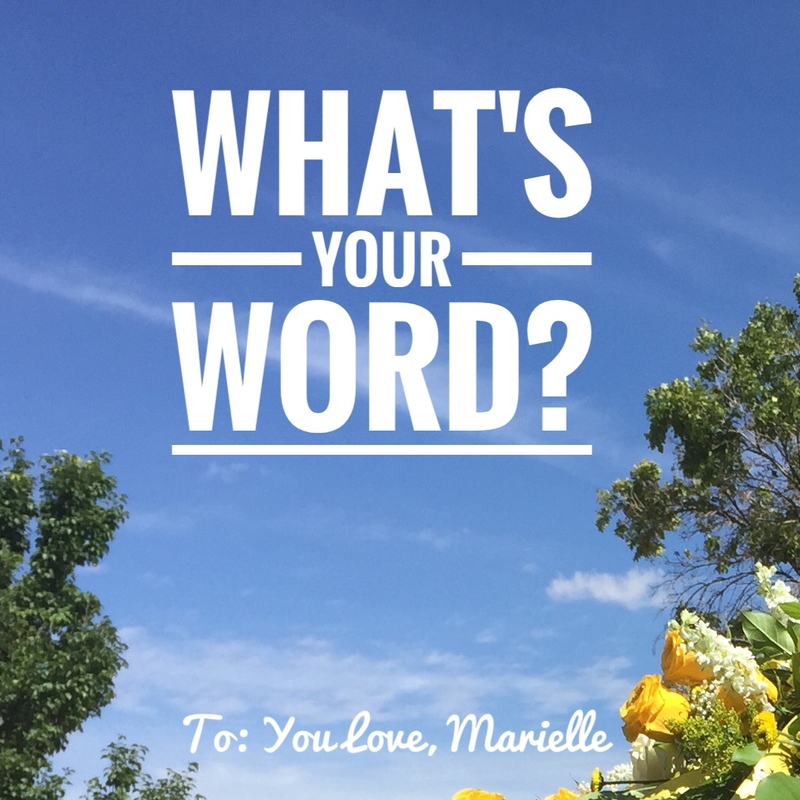 What is your word? I would love to hear about it all from you. Please share in the comments. What a blessing for me to join this incredible family. I could just have easily written about any one of them And I just might do that someday! Thanks for choosing me Babe! This post may be shared at some or all of these Link-Ups. With the new school year starting up, I am also beginning home preschool with my four-year-old. I thought it would be fun to share our preschool plans and adventures. With so much kid-focused content coming up, I decided it would be great to have a new place for all things "kids." I truly love being a mom and hope I am making the most of the fleeting time of childhood for my kiddos. You know that cliche' about it going so fast? Well, that. It's going so fast! I hope that my sharing my "mom-thoughts" will help others, either with their own kids or other little ones in their lives. 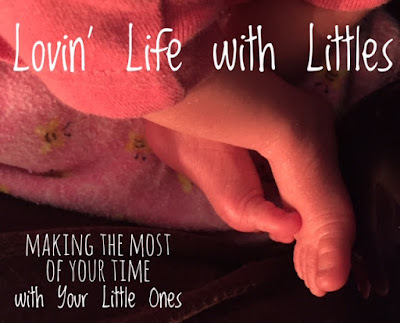 If you have any interest (or know someone who does) in activities for kids, funny kid stories, preschool lesson plans, baby tips, routines, etc. please come visit, follow, and share my new site. I'm excited about this new avenue and hope to meet up with you there often! I will continue posting here about life and my musings. Thanks for coming along for the ride! The other day I read a short article entitled "True Religion." The message of the article caught me and left me thinking on it all day. As part of that profound yet simple message, the author elaborated upon the words of James by saying, "'Pure religion' is more than a declaration of belief; it is a demonstration of belief." That belief is best demonstrated through the way we treat others, through selfless service. The author gave three keys for growing in our ability to serve others. Seek Seek to be like the Savior and serve others. Opportunities to serve may be inconvenient, but we ought to have the desire to help others. See Recognize the needs of those around us. Act We may feel inadequate to meet or alleviate the great needs surrounding us. However, we need to trust that God can work through us when we choose to act. We see this lesson in the quintessential sermon on service: the Parable of the Good Samaritan found in the New Testament in Luke 10:25-37. 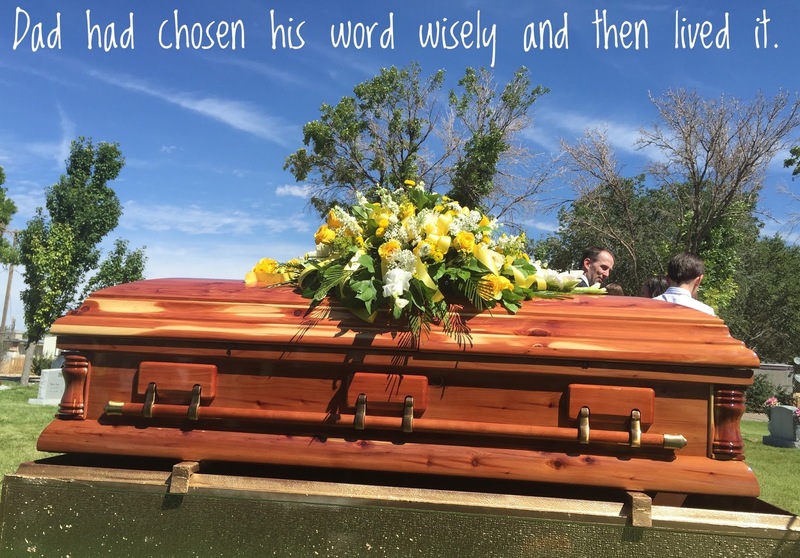 In this well-known story, a lawyer asks the Savior what he should do to inherit eternal life. Christ allows the man to answer his own question with the injunction to "love the Lord thy God with all thy heart, and with all thy soul, and with all thy strength, and with all thy mind, and thy neighbor as thyself." This is a law that had been taught at least since the beginning of biblical times. (For example see Deuteronomy 6:5 and Leviticus 19:18.) Yet, it is a law that just as early as that until today can be difficult to put into practice. The lawyer seems to recognize that difficulty and tempts Christ by asking, "And who is my neighbor." Then follows the story. A man was robbed and left wounded on a traveler's road to Jericho. A priest (a "religious" leader) and a Levite (a man of the temple) in turn saw the man but passed by on the other side of the road. A Samaritan next travels the road. He saw the man and "had compassion on him." 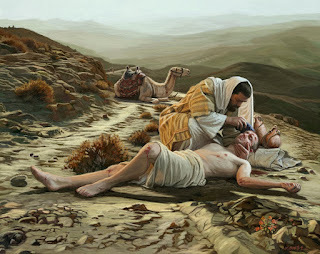 The Samaritan tended to the man's wounds, cared for him at an inn, and provided for his further comfort. The Samaritan was of a loathed class and foreign city. He could have felt that the traveler got what he deserved or that if the tables were turned, that man probably wouldn't help him, a Samaritan. He could have been too busy or in too much of a hurry to get where he was going. He could have assumed someone else should or would help out. Instead, we find a man who sought to serve others, saw a need, and acted. Now for our lesson. Jesus asked, "Which now of these three, thinkest thou, was neighbor unto him that fell among the thieves? And [the lawyer] said, He that showed mercy on him." 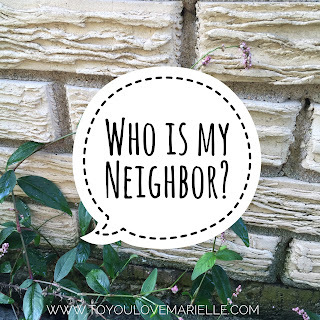 So who is a neighbor? He who makes himself a neighbor through merciful compassion. Mercy is the "kind or forgiving treatment of someone who could be treated harshly." The dictionary says that compassion is a "sympathetic consciousness of others' distress (see) together with a desire (seek) to alleviate it (act)." "Then said Jesus unto him, Go, and do thou likewise." We must live outside ourselves enough and at a pace requisite to see and allow ourselves to feel for others. Then we must act with mercy. I find it interesting that one common use of the word "mercy" throughout the Bible is in mention of the Mercy Seat. This was considered the throne of God; it was God's meeting place with man. God meets and deals with man with mercy. We ought to follow the Greatest of All. What does it look like today? How are we neighbors? It may look like a young lady helping a homeless person, gentleness across political lines, or maybe it's a white police officer being kind to a black woman. Most likely, it is small and simple acts. If you were me in the last couple months of pregnancy, worries, delivery, and life, you would have seen many neighbors in action. 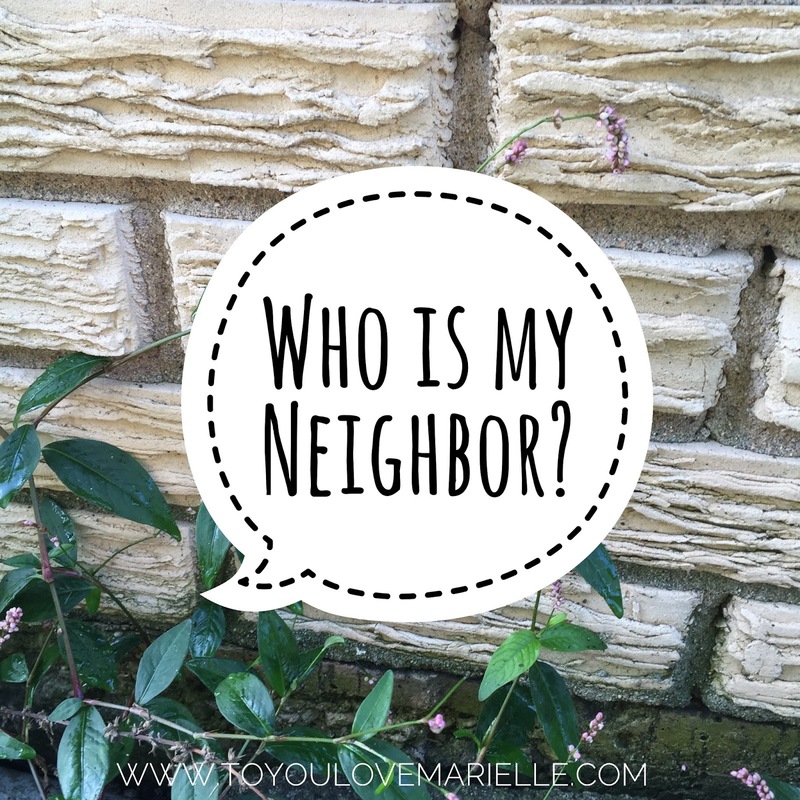 What does my neighbor look like? My neighbor looks like the mom who watches your children, keeps them longer than planned, and always insists that it's nothing. It is the friend's dad who drives the extra carpool. It is the one who listens to the excitements and fears of your life with genuine interest, joy, or concern. It is the neighbor who brings over a warm dinner on a night when the kids are tired. It's the friend who shares her talents and knowledge in a perfect timing unforeseen by either. It's the one who slips you gas money before a much anticipated road trip. It is the neighbor's lawn care team who quickly and quietly mow your lawn while you're picking up the kids from school, twice. It is the hugs and kisses that kids give best. Its the one who fasts and prays for another. It is the little one who offers the heartfelt prayer, "Help Mommy to be healthy when the baby comes." It is the husband who holds your hand through contractions and seems to know exactly when to encourage, when to compliment, and when to crack a joke. It is the friend or family member who texts with joy and delight, even when their personal struggle could lead them to think, "Why not me?" It's the friend who says, "Call me if..." and you know she means it because she's already done it countless times. It's the call or text or email, "Thinking of you." It is the angel mother who comes to town and cooks and cleans and entertains, who gives up sleep, habits, hubby, and other worthy duties to bring patience, fun, and constant service, all the while making you feel like it is her joy. It's the father who works tirelessly so mother can afford to do that. It's the person who says, "I love you" and means it. It has been said that we are losing our humanity. That could be true. 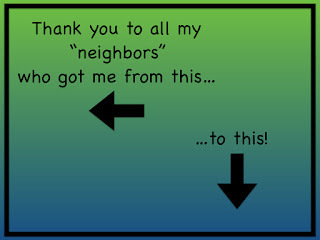 But in my little world, there are more neighbors than not. I hope all of my neighbors know how grateful I am for them. I have been humbled and awed. Thomas S. Monson said, "Each of us, in the journey through mortality, will travel his own Jericho Road. What will be your experience? What will be mine? Will I fail to notice him who has fallen among thieves and requires my help? Will you? Will I be one who sees the injured and hears his plea, yet crosses to the other side? Will you? Or will I be one who sees, who hears, who pauses, and who helps? Will you? Jesus provided our watchword, 'Go, and do thou likewise.' When we obey that declaration, there opens to our eternal view a vista of joy seldom equaled and never surpassed." I offer my heartfelt thanks to all who have made themselves my neighbor, and I hope that each of us will feel the joy that comes when we choose to make of ourselves a true neighbor. I know many moms are anxious to get the kids back in school after a break. In fact, one of our beloved Christmas carols has memorialized the phrase "And Mom and Dad can hardly wait for school to start again!" However, I love having the kiddos home! Perhaps it's the lazy side of me that doesn't want to get up and out the door every morning. :) Truly though, I do enjoy getting to plan and spend my days with these youngsters. I think it's also important to note that a successful break does not have to include travel or expensive outings. Part of the great joy of these breaks is the opportunity to help the kids enjoy the little things in life. 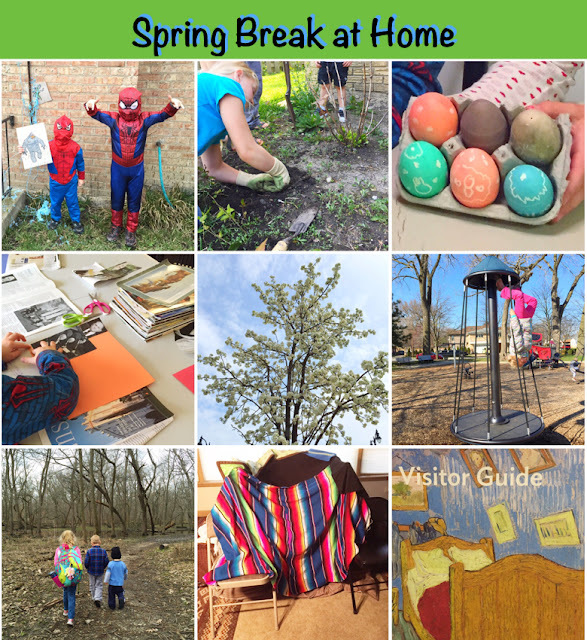 Here's a small glimpse of the fun that was our Spring Break. Learn how to be nice to each other!!!!!!! I had previously checked the local library for events as they are great about scheduling a variety of activities for times when kids are out of school. We ended up going to a craft event and a Dinosaur Dig. The dinosaur experience was awesome as we got to meet two paleontologists, see pictures from their dig site, and hold dinosaur bones! I also checked the local museums and city parks for free-days or low-budget events. 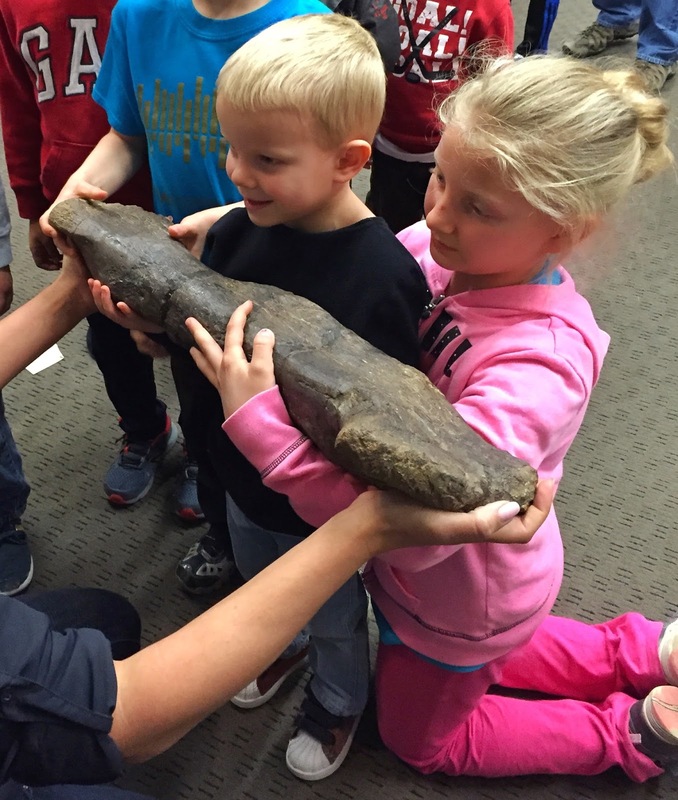 Holding a fossilized dinosaur bone at the library. 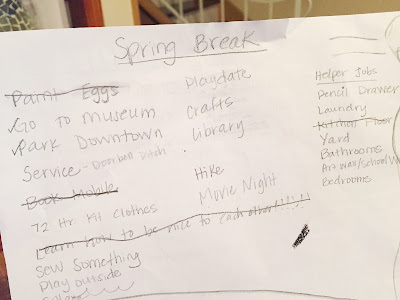 After making our list, we got out the calendar and plugged the activities into the different days, taking into account the weather and anything that was previously scheduled. We aimed for one planned thing each day and left plenty of time for "just playing" as well. Some fun spontaneous happenings included building a fort and sleeping in it and having Dad make villains and hide them around the yard for Spider Man 1 and 2 to web with silly string! For one of our craft activities, I pulled out some old magazines and the kids made a collage. We hadn't done this for a long time and the kids loved chopping and gluing! You can choose a theme such as things that remind you of spring or Easter or just let them go. We made ours around Easter and the kids picked pictures that help remind them to follow Jesus. It was a simple, fun craft. A definite highlight was our little hike. We packed up a lunch and headed to a nearby trail. What a treat to see a woodpecker and six deer before we'd been walking ten minutes! Our oldest brought a little notebook to write or draw about what she found interesting. We investigated different tracks, examined the new spring plants, and at the end of the hike, definitely enjoyed all the mud! :) There is so much beauty and intrigue in nature no matter where you live...guarantee the kids will love it more than the iPad! While there wasn't anything too glamorous in our plans, we had a wonderful time being together and doing a variety of activities. There were smiles, looks of amazement, laughs, feelings of accomplishment, and a little bit of whining too I'm sure. :) These are the times I know will go by way too fast. I am so grateful to be able to soak them up!!! I hope you and your little ones get to enjoy lots of time together. What are some of your favorite ways to spend breaks from school? What are some of your favorite memories from breaks? Welcome! Here we will delve into household management, healthy lifestyles, navigating parenthood, and all of Life's Lessons I am trying to learn! I look forward to interacting with you and sharing all things Living and Loving! Welcome to the World Blog!!! Be sure to enter your email address on the right sidebar above to receive an email when new content is published. Of course, I will never share your information! Thanks for following!